The activities programme has been developed to offer a flexible tailor-made safari experience for an unforgettable Sabi Sands family holiday in Mpumalanga. This luxury safari lodge offers a range of activities to enjoy during you Sabi Sands holiday near Kruger, including exciting game drives, bush walks and relaxing spa treatments. Experienced rangers will assist you in tracking African wildlife through pristine Big Five country. 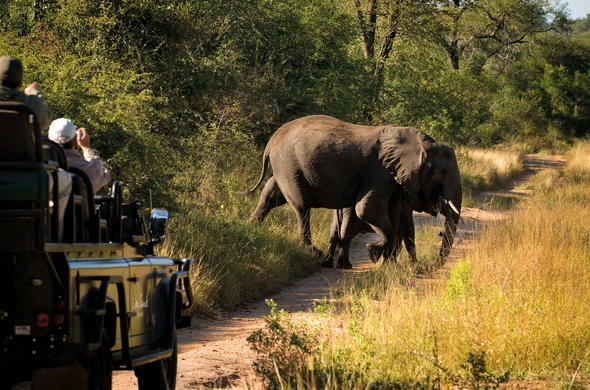 Keep your camera close at hand to capture your Sabi Sands holiday memories on a guided bush walk. This is an opportunity to get close to the bush and see its smaller creatures and learn about indigenous plant and insect life from your knowledgeable guide. Bird watching is excellent and you could spot Bateleur, Martial Eagle and Crowned Plover amongst many other species. Game drives are offered daily at dawn and dusk, with the evening drive allowing you the chance to spot nocturnal wildlife such as Leopard and Hyena. Spend the afternoon lazing around the pool or relax with a soothing massage at the Africology Spa. The spa offers a wide variety body, facial and hydrotherapy treatments. This Family Friendly Lodge is situated in the Greater Kruger National Park area. The two swimming pools overlook the scenic Sabie River. Be pampered by therapists at Lalamuka Health Spa with an array of body, facial and hydrotherapy treatments available.